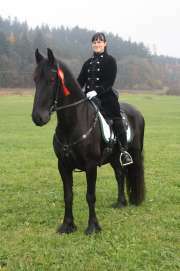 Franziska D. on Frisian Artus: "I am very proud of our self-designed Vaquero Breitschaft ..."
"I decided to buy the Ibero Vaquero Breitschaft about 4 1/2 years ago. It was then very difficult for me to decide for a saddle maker or saddle, since I had very high demands and my easily built Frisian Artus was only five and physically still changed constantly. We are very versatile, ride dressage and trek in rough terrain. So I wanted a saddle, which can always be adjusted well and offers comfort to the young back and my po without limiting us. When I saw your saddles at the fair in Munich and learned from a great consultation, that you can fulfill all my wishes and I am able to make the saddle according to my wishes, you had won me as a fan. After very nice contact with the customer service, I was quickly given a consultant nearby, who was preparing the different models on site. Mr. Schulte advised me very well on model, material and personalization options. This is how my dream saddle came about. I am very proud of our self-designed Vaquero Breitschaft with all the special equipment I have wished for. Working has been so much more fun since we have this saddle. He is an excellent working saddle with a great look and feel. I have never sat so comfortably on a saddle and had so good contact with the horse. And the positive feedback from my horse steward speaks for itself. You can only recommend this saddle! Thanks to the entire Ibero team for the great work!"